Published earlier this year in RSC Advances (RSC Adv., 2013, 3, 19081-19096), a follow-up (for my part) to the study The Low-/Room-temperature Forms Of The Lithiated Salt Of 3,6-dihydroxy-2,5-dimethoxy-p-benzoquinone: A Combined Experimental And Dispersion-Corrected Density Functional Study in CrystEngComm last year. The theoretical section for this paper is a tour-de-force of Crystal09 solid-state optimizations, density functional and dispersion-correction dependence, and post-processing using Carlo Gotti’s TOPOND software. In brief, the combination of vibrational spectra, electochemical measurements, and solid-state density functional theory tests are used to predict the structure of the previously unknown lithiated tetramethoxy-p-benzoquinone structure based on the good-to-excellent agreement with two known TMQ crystal structures (the testing of density functionals and dispersion corrections being a very good survey of the pros and cons of the varied methods. If you were pondering an approach to follow to perform the same kind of theoretical analysis, the procedure set up by Gaetan and Christine in this paper is fully worth your consideration). In the search for low-polluting electrode materials for batteries, the use of redox-active organic compounds represents a promising alternative to conventional metal-based systems. In this article we report a combined experimental and theoretical study of tetramethoxy-p-benzoquinone (TMQ). In carbonate-based electrolytes, electrochemical behaviour of this compound is characterized by a reversible insertion process located at approximately 2.85 V vs. Li+/Li0. This relatively high potential reactivity, coupled with our effort to develop computational methodologies in the field of organic electrode materials, prompted us to complement these experimental data with theoretical studies performed using density functional theory (DFT). Single crystals of TMQ were synthesized and thoroughly characterized showing that this quinonic species crystallised in the P21/n space group. The experimental crystal structure of TMQ was then used to assess various DFT methods. The structural features and vibrational spectra were thus predicted by using as a whole five common density functionals (PBE, LDA, revPBE, PBEsol, B3PW91) with and without a semi-empirical correction to account for the van der Waals interactions using either Grimme’s (DFT-D2) or Tkatchenko-Scheffler (TS) scheme. 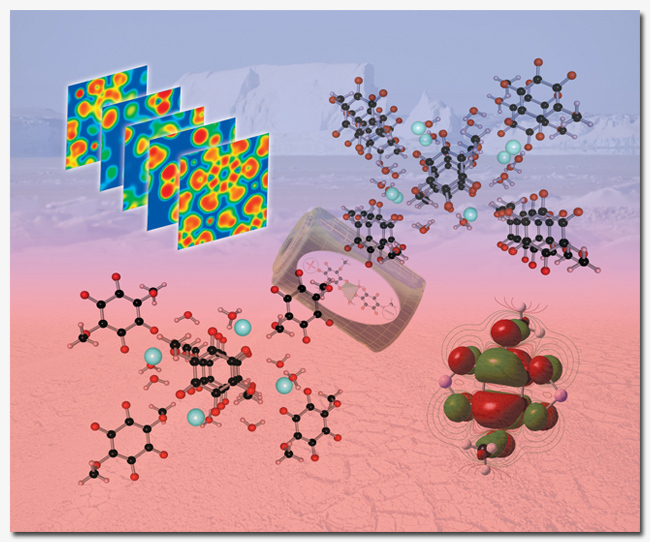 The most reliable combination of the DFT functional and the explicit dispersion correction was chosen to study the Li-intercalated molecular crystal (LiTMQ) with the view of indentifying Li insertion sites. A very close agreement with the experiment was found for the average voltage by using the most stable relaxed hypothetical LiTMQ structure. Additionally, a comparison of vibrational spectra gained either for TMQ molecule and its dimer in gas phase or through periodic calculation was undertaken with respect to the experimentally measured infrared spectra. 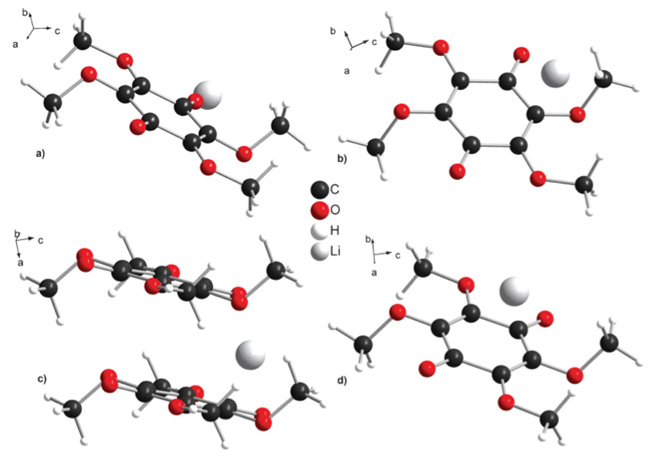 The topological features of the bonds were also investigated in conjunction with estimates of net atomic charges to gain insight into the effect of chemical bonding and intermolecular interaction on Li intercalation. Finally, pi-electron delocalization of both quinone and alkali salts of p-semiquinone were determined using the Harmonic Oscillator model of Aromaticity (HOMA) or aromatic fluctuation index (FLU) calculations.